Is Harry Mudd a Murderer? While “I, Mudd” sets up Harry as a sort of lovable buffoon on the run from his ghoulish wife (and is completely willing to strand 400 people in order to ensure his own freedom), “Mudd’s Women” sets him up to be a bit more of scoundrel than we often remember him. Obviously Mr. Mudd is a human trafficker. Studio memos at the time refer to Mudd’s women as “space hookers”. Mudd is also a drug dealer, handing out illegal substances to keep the lady’s in line. He’s also perfect happy to see the Enterprise burn up with all hands on board, again, to secure his freedom. This is one flipping terrible human being. But there’s one bit in “Mudd’s Women” that can be read as seriously evil, and that’s the fate of the real Leo Walsh. After the computer IDs Harry as his Harcourt Fenton self, he admits Walsh, who was the actual owner of the J-Class freighter Mudd and his chattel were found on, met an untimely fate and Mudd was forced to commandeer his vessel in order to complete his business transactions. Now Mudd is nothing if not a liar, so there has to be more to this story then he’s willing to admit. The question is, did Mudd kill Walsh and take his ship, or did Leo really just keel over at an inopportune time? Did Harry Mudd murder the real Leo Walsh? Yes, he's completely capable of killing someone, and certainly did. No, Leo died of natural causes. 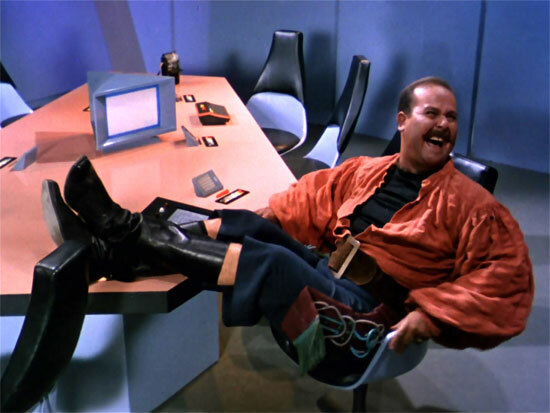 Mudd stole Walsh's identity and ship, but Leo is probably alive in some storage locker. Have any other ideas about how Harry got that name and ship? Tell us in the comments! Going by the latest episode of Discovery, the answer is a resounding yes. If we’re gonna be technical here, Leo Walsh was never said to be the owner of the J-Class freighter, he was merely supposed to be its captain because Mudd’s license had been revoked (in maritime trade on Earth, most freighters aren’t owned by their captains, either). It’s possible the two never even met, and Mudd identity-thefted Walsh’s credentials or got a tip on a license-holder whose death hadn’t been reported to the authorities. It’s even more possible that Leo Walsh never existed in the first place, and Mudd was using a fake ID of sorts. KIRK: Mister Mudd, you’re charged with galaxy travel without a flight plan, without an identification beam, and failure to answer a starship’s signal, thus effecting a menace to navigation. MUDD: What? My tiny ship in this immense galaxy a menace to navigation? KIRK: You’re also charged with operation of a vessel without a master’s license. MUDD: Untrue! I have a master’s ticket. COMPUTER: Incorrect. Master’s license revoked Stardate 1116.4. MUDD: All right. Well, very simply, Leo Walsh, who was to be my captain on this trip, passed away suddenly. Well, I had no choice but to take out me ship me own self. I assumed Leo’s name out of courtesy to him. In memoriam, as it were. A fine, fine man, alas, gone to his reward. Not that I’m asking anyone to write a prequel to “Mudd’s Women,” Vaal forbid, but I prefer to speculate on what would make the most likely backstory for Mudd that adds to his rap sheet, not on the most innocuous sequence of events that he merely took advantage of. That dialog’s “passed away suddenly” tells me that something more than an unreported death or a forged identity had occurred. There was a Walsh, and Mudd was somehow involved with his death. That’s why he was flying incognito and ran as soon as he saw Enterprise on his tail. As Maurice and Joseph suggested, Mudd might not have pulled the trigger, but he’s part of the reason it was pulled. All due respect to Mr. Farinas, but the idea of merely marooning Walsh somewhere just doesn’t paint a picture with very strong colors. I have to say, I missed the part about Mudd claiming the ship is his own but captained by Walsh. From the dialog that seems to be the case. I would then wonder if Walsh had a problem transporting drugged up women across the galaxy and tried to bail. Mudd could have done away with him under those circumstances. Or maybe he absconded with the ship of someone who passed in other circumstances. The memos I’ve read—Theiss “space hookers” drawings aside—indicate that Harry is meant to be a “comic villain” in a Sir John Falstaff vein. Falstaff was the sort who would take credit for other people’s deeds. He’s basically a blowhard, a coward and a criminal scoundrel. That doesn’t let Mudd off the hook. But my own gut reaction is Harry is not the kind to put a knife in someone’s back, but neither will he do anything to prevent that person from getting shivved if it gets him what he wants. Yes he most likely takes care of himself. By any means necessary. Mudd has never struck me as the sort of criminal who would ever get his hands that directly dirty if he could help it. I agree he’s a horrible person with a greatly overdeveloped sense of personal entitlement… But he also seems to be aware that he’s not quite good enough to evade capture forever. He seems like he actively plans for it, and murdering Leo Walsh would leave him with very few possible ways to weasel out of the consequences if he were caught. I could easily see him marooning Leo somewhere, or perhaps just allowing a preventable accident to take him out of the picture though. I included the bit about stranding Walsh somewhere because I saw someone mentioned it as a possibility on TrekBBS when I went googling to see if anyone else got a murder vibe from that scene. My problem with it is that if Walsh is still alive, why say otherwise? Why not simply say he got ill or otherwise incapacitated? Saying he’s dead seems to draw unnecessary attention to a situation where no death has occurred. Unless Mudd is just trying to convince them that there’s no point looking for the true owner, he’s dead dead dead and won’t be turning up so why talk any more about such a terrible tragedy? Considering the amoral cunning with which first-season Mudd is written, I can see Mudd having killed Walsh. But I can more readily see Mudd having indirectly caused Walsh’s death, done nothing to prevent it, and taken his identity as an ad hoc escape from a mess that he’d made. “Wiving settlers” might even have originally been Walsh’s gig, enjoying limited success until Mudd came along with the Venus Drug. Having of course tried to swindle his supplier, it’s easy to imagine some sort of unpleasantness that could result in Walsh’s mistaken death, and Mudd’s hasty escape with Walsh’s identity, ship, and cargo. Mudd’s the worst, and I’m just hoping for a lot of suffering in the current arc.